By Angel Hsu and Andrew Barnett, part of ‘Team China’ tracking the Chinese delegation a the Copenhagen climate negotiations. These posts are originally being featured on Green Leap Forward and also cross-posted on Climateprogress.org and the Yale Center for Environmental Law and Policy blog. As we predicted from the beginning, the negotiations in Copenhagen are coming down to two countries that could make or break a deal – China and the United States. As we mentioned in our post on Day 9, the crux of this deadlock seems to be centered around a few critical issues. The United States’ Congress won’t pass domestic legislation without key developing countries like China, which is now a major greenhouse gas emitter signing on to reduction commitments; and China sees themselves as a developing country that has acted progressively and responsibly to address climate change when it technically has no obligation to do so under the UNFCCC. Sure, we know that the U.S.-China showdown makes for great headlines and COP-15 drama. It’s been exciting to see leaders from both the U.S. and China duke it out Celebrity Deathmatch-style through sharp words, criticisms, and finger-pointing over the course of the past 10 days in Copenhagen. However, as we mentioned yesterday, we’re not so sure that this is a genuine “impasse” between the two countries is immovable or, instead, a nuanced disagreement over issues like MRV (“measurable, reportable, verifiable”) that can be resolved before the heads of state meet Thursday and Friday. We’ll provide updates on some of the U.S.-China dialogue on the MRV issue in this post, as well as provide suggestions as to how the U.S. and China might work swiftly together to bring resolution to key sticking points (as if Beijing were built in a day). 1) Which comes first – the chicken or the egg? U.S. climate bill or China MRV? As we’re continually reminded, the negotiations are a frustrating Catch-22: prior to COP-15, negotiations were hinged on U.S. legislation and now U.S. legislators are focused on Copenhagen to provide directive as to what kind of legislation should be passed. 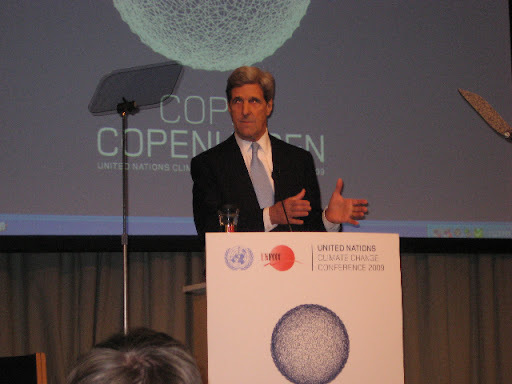 Senator Kerry’s speech made clear the importance of the Copenhagen talks on domestic efforts to pass a climate bill. Kerry sees the importance of COP15 decisions (i.e. firm commitments from India and China) in helping the Senate pass a strong and worthy climate bill this spring. He was clear that China and India must commit to MRV, suggesting that the fate of U.S. climate legislation may rest on China’s Copenhagen concessions. This is an interesting carrot the U.S. is dangling in front of China. As we’ve heard repeatedly throughout the Copenhagen talks, the China wants U.S. action and it seems as if Senator Kerry was suggesting Congress is looking to see what China commits to here before it is willing to enact climate legislation in the U.S. However, in a press briefing this afternoon that was delayed by 90 minutes due to consultations between China and the G-77, lead Chinese negotiator Su Wei revealed that China is ready to wait. Mr. Su said, “In China we have a saying, it’s worth waiting for a feast and we are well prepared to wait for this banquet,” suggesting that China is hungry but not desperate. Chinese climate action is, in yet another Catch-22, contingent on American legislation. Our heads are already collectively spinning trying to keep these Catch-22s, chickens, eggs, and legislation straight. But what it all comes down to again, is the big MRV elephant in the room. Senator Kerry again today emphasized that China’s willingness to agree to international MRV is the principal issue for the negotiation’s final days. If China doesn’t agree, Senator Kerry said the U.S. is also considering trade sanctions in the form of carbon tariffs to try to bully China at the negotiating table. Already yesterday (Day 9), we heard Ambassador Yu Qingtai say that China would not stand for any climate-related trade barriers. Mr. Zhu Guangyao, Assistant Minister of Finance of the People’s Republic of China, reiterated this point today (Day 10) but also mentioned that China is considering domestic carbon taxes. With the clock ticking and negotiations coming down to the wire, what moves by the U.S. and China can help unlock the deadlock that has been slowing down an agreement? David Doniger and Barbara Finamore of the Natural Resources Defense Council suggest that the U.S. and China involve increased finance commitments on the part of the U.S. and greater transparency and international verification on the part of China. Taking cue from Doniger and Finamore, these are two points we’d also like to analyze from our observations at COP-15. First, with regards to MRV. While we won’t go too much into detail, as we discussed the MRV issue at length in our last post, it seems that much of the discrepancy on MRV positions between the U.S. and China may in fact be due to lack of clarity or something that’s been lost in translation. As we noted, China is not opposed to MRV for actions that are requesting or receive international finance, technology, or capacity building. We’ve heard many top Chinese leaders on the negotiating team, including Vice Minister of Foreign Affairs He Yafei and Ambassador Yu, stress that China has robust systems of measurement and will work to make their reports “transparent” and “publicly available.” Sound familiar? Could these reports be similar to the national communications required for Annex-I (e.g. developed countries) by the UNFCCC, which include information about all greenhouse gas sources, calculation methodology, and sectors? As we already explained previously, China (along with South Africa, India and Brazil) have been thinking of transparency measures along the lines of national communications. Mr. Su reitered during this afternoon’s press conference that perhaps the U.S.’s demands for greater transparency regarding China’s mitigation actions could be partly addressed through such national communications, of which China has already submitted its first in 2004 along with other non-Annex I (e.g. developing countries). This communication already includes information regarding China’s greenhouse gas inventory, albeit in much less detail and than is required for Annex I countries. As was decided during their Nov. 14-15 Meeting, Presidents Obama and Hu agreed that the U.S. EPA will assist China in developing its national greenhouse gas inventory, providing a greater level of assurance that the Chinese are accurately accounting for emissions using best-practices and sound methodologies. While it’s been clear in our conversations with U.S. government officials here that this does not mean “supervision” or over the shoulder-looking of China by the U.S. (and thus allaying China’s fears of intrusiveness), this move should provide major headway for the U.S. in terms of the transparency issue. Chinese officials have been under the impression that the United States wants factory-level inspections of their domestic efforts to cut carbon — rather than the macro-level data and clearly spelled-out methodology officials now apparently are making clear they need. Indeed, facility-level information and verification of emissions data coming out of every smokestack and tailpipe in China would create undue burden on all sides. 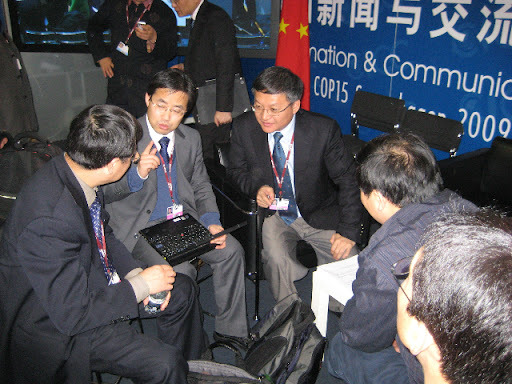 However, grassroots and NGO efforts to establish voluntary greenhouse gas registries for Chinese businesses and organizations (similar to the Climate Registry in the U.S.) could pave the way for eventual regional or national registries that could ground-truth information the Chinese government provides in its national communications. But the U.S. is still one to talk – even the Climate Registry in the U.S. is not all-encompassing and the fact remains, no climate legislation has passed. China still wins on this point. Second, with regards to the financing question. As we’ve also heard and witnessed the intricate dancing of Chinese leaders, financing is also a large bone of contention still at hand. In a press briefing, Ding Zhongli, Vice President of the Chinese Academy of Sciences, responded, “I think the U.S. side could increase its intensity for mid-term emission cuts. At least that level could be consistent with the cuts of the European Union. Second, I hope the U.S. Government could be more generous with finance to developing countries.” Well, sorry Mr. Ding, but the U.S. probably won’t be able to budge on the emissions front, but finance could increase with passage of the Kerry-Boxer Senate bill. In his speech today, Senator Kerry also committed his Senate bill to financial assistance for developing countries. The developing world is waiting for the U.S. to deliver on its promises of finance, which so far developing countries say developed countries have yet to translate their words into action. Such a move, which Doniger and Finamore say also need to be verified, could also help to grease the negotiation wheels as we speed into the end of Copenhagen. I have often quoted a Chinese proverb which says that when you are in a common boat, you have to cross the river peacefully together. Well, we are in a common boat. All of the major economies have an obligation to commit to meaningful mitigation actions and stand behind them in a transparent way. And all of us have an obligation to engage constructively and creatively toward a workable solution. We need to avoid negotiating approaches that undermine rather than advance progress toward our objective. With heads of state now arriving, significant work remains while the clock ticks. While parties acknowledge the long term nature of this process, nobody wants to leave Copenhagen empty-handed. Will heads of state be able to hatch a plan to leave with an operational accord in hand, or offer platitudes for a process that failed to deliver? Team China will most likely not be allowed access into the Bella Center for the final two days. Therefore, we’ll be watching the news and web-streams of events like hawks and provide a final wrap-up at the end. Team China member and Yale graduate student Alyssa Go contributed to this post. Additionally, Julian Wong provided updates above.